Do you think this photo represents some rural town somewhere? Then you are mistaken at its worst. And this is not that somewhere but, the coronary artery of Bengaluru, the Brigade road. It is known as one of the biggest and busiest shopping areas in south India. The place has retail outlets of many International brands. It has also been famous as one of the prominent New Year celebration hub of the city for years. In 2004, parking meters imported from France installed at this place, where 1,400 cars parks each day. But, the accessibility of Brigade road is never been discussed anywhere it seems. Here we are not pointing fingers at anyone, but just a tour of realization. 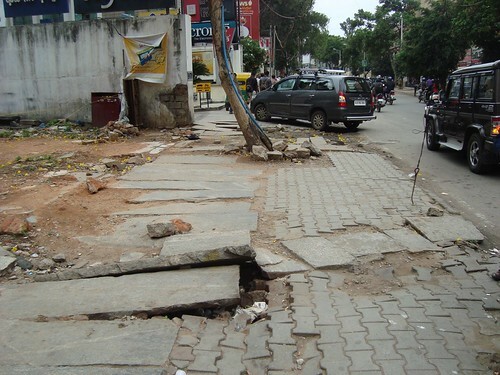 The condition of footpaths are so pathetic that, even a normal individual with perfect health cannot walk that easy; but, should beware of his/her disability nearby. And there is no point of asking this facility (footpath) for those pregnant women, children, senior citizen or the disabled at this point of time.